White Wolf : Friends Furever: Adorable Baby Crawls Up to Husky to Say Hello. Friends Furever: Adorable Baby Crawls Up to Husky to Say Hello. Growing up with dogs can be an amazing experience for kids. Living with furry, four-legged best friends not only means that they always have someone to play with but also that they have a loyal companion for life. Plus, many studies have shown that kids who grow up with pets have higher immune systems and tend to be more social and compassionate. Sounds like an amazing set up for life to us! The baby in this video has the absolute pleasure of having an awesome Husky friend to play with 24/7. Huskies are generally very energetic dogs, so once this little one learns to walk, she’ll certainly have someone to run laps around the house with! Seeing the dog’s gentle and patient reaction to the baby’s greeting is sure to bring a smile to your face. Remember, it is always important to supervise kids when they are playing with dogs. 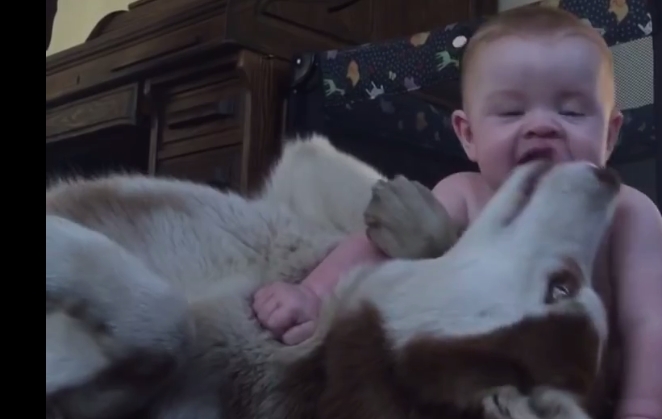 This Husky knows exactly how to gently play with the baby, but other dogs might not be so in-tune. Responses to "Friends Furever: Adorable Baby Crawls Up to Husky to Say Hello. " love how submissive the dog is. too cute!